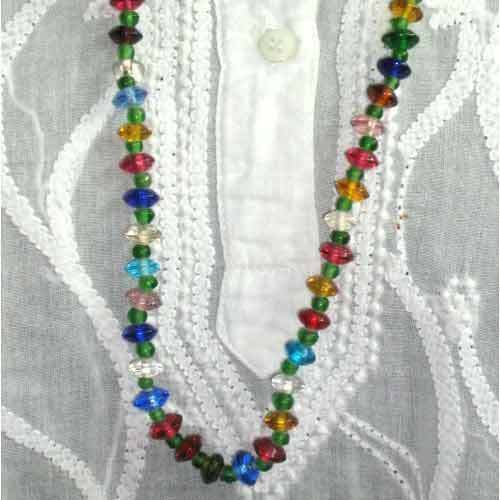 Avail from us an exclusive range of Multi Colored Beaded Necklaces which is fashionable, trendy and offered in a variety of designs and patterns. The necklace combine both traditional and modern look which makes it best for any function. We also meet customized requirement and market these at competitive prices. To carry forward the rich heritage of India, we at 'Mia Dastkar Zariwale Private Ltd' are involved in offering a mesmerizing variety of clothing and accessories. Hailing from the city of Nawabs-"Lucknow", which is worldwide popular for its royal traditions and famous chikankari work, we provide a glimpse of this historical city with our unique range of products. Our alluring collection includes a comprehensive array of chikankari apparels for men & women, uniforms, industrial safety garments, stoles, fashion jewelery, cushion covers, table linen, kitchen garment and home decor items. In addition, we also satiating our clients with various types of herbal cosmetics & perfumes, handmade shoes and many other products. These products are widely acknowledged for their artistic beauty, unique designs and appealing color combination. Manually crafted by skilled artisans, our range can also be availed in fully customized specifications by our clients. We are associated with various world known organizations that help us to easily reach different parts of globe. Supported by TNT Fashion Logistics, we are able to entertain small orders and also save huge amount on freight charges, leading to cheaper products to clients. Apart from this, we are also associated with Kalatmak Handicrafts, Tradecraft and FAKT, Germany. In order to make recognized the traditional Indian craft on global platform, we also participate in fashion shows organized by government of India. Further, we also consider our corporate social responsibility and believe in fair fee to each person engaged with our organization.